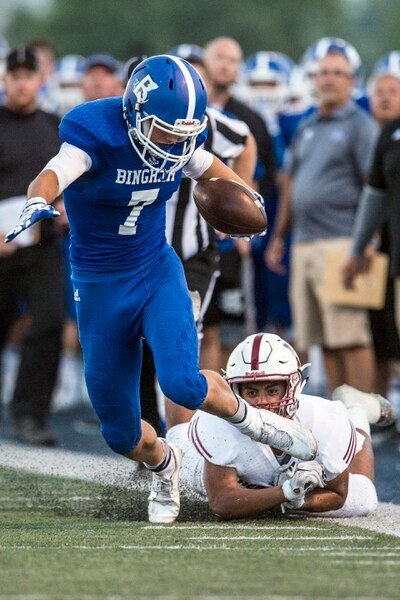 (Trent Nelson | The Salt Lake Tribune) Bingham wide receiver Brayden Cosper, one of the top receivers in the state, will play a key role in the Miners' attempt to take down East on Friday. Cosper was photographed in South Jordan Tuesday August 22, 2017. Scott Sommerdorf | The Salt Lake Tribune Bingham WR Brayden Cosper gets the ball to the 4 yard line before Lone Peak's Ammon-Kaonohi Hannemann pushes him out of bounds. Bingham led Lone Peak 21-9 at the half, Friday, September 2, 2016. Chris Detrick | The Salt Lake Tribune Bingham's Brayden Cosper (7) runs past Herriman's Sefanaia (Jr.) Leakehe (5) during the game at Bingham High School Friday August 26, 2016. Chris Detrick | The Salt Lake Tribune Herriman's Taylor Pursley (2) tackles Bingham's Brayden Cosper (7) during the game at Bingham High School Friday August 26, 2016. Chris Detrick | The Salt Lake Tribune Mountain Crest's Cody Olsen (31) breaks up a pass intended for Bingham's Brayden Cosper (7) during the game at Bingham High School Friday November 6, 2015. Leah Hogsten | The Salt Lake Tribune Bingham's Brayden Cosper is bear-hugged on the sidelines after his two touchdowns in the final minutes of the game. Bishop Gorman defeated Bingham 38-20. Nationally No. 7-ranked Bingham High School hosted No. 1-ranked Bishop Gorman High School from Nevada, September 4, 2015. Leah Hogsten | The Salt Lake Tribune Bingham's Brayden Cosper catches a touchdown throw in the second half. Bishop Gorman defeated Bingham 38-20. Nationally No. 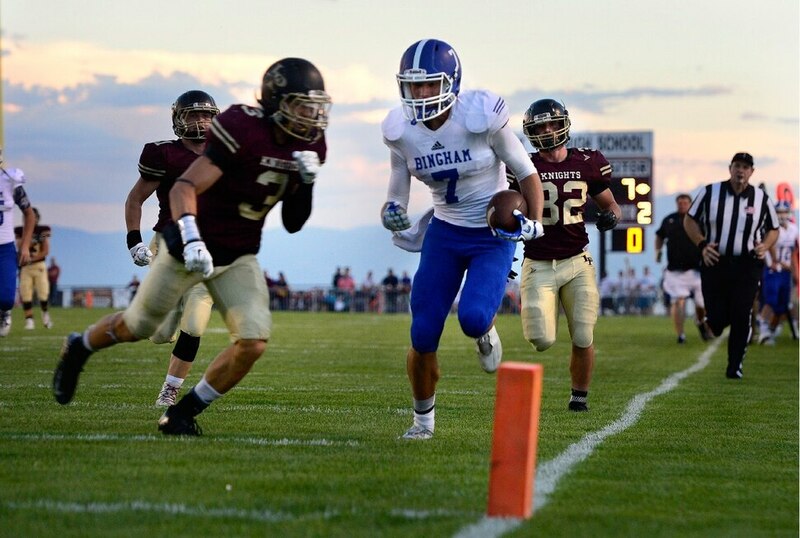 7-ranked Bingham High School hosted No. 1-ranked Bishop Gorman High School from Nevada, September 4, 2015. Chris Detrick | The Salt Lake Tribune Bingham's Brayden Cosper (7) makes a touchdown catch past Lone Peak's Eli Norman (9) and Lone Peak's Tanner Hansen (23) during the 5A football championship at Rice-Eccles Stadium Friday November 18, 2016. Leah Hogsten | The Salt Lake Tribune Bingham's Brayden Cosper makes a touchdown in the final seconds of the game over the defense of Bishop Gorman's Damuzhea Bolden. Bishop Gorman defeated Bingham 38-20. Nationally No. 7-ranked Bingham High School hosted No. 1-ranked Bishop Gorman High School from Nevada, September 4, 2015. Scott Sommerdorf | The Salt Lake Tribune Bingham WR Braydon Cosper runs after a catch during first half play. Bingham led Lone Peak 21-9 at the half, Friday, September 2, 2016. South Jordan • Brayden Cosper seemingly had a ton of advantages for a high school junior wanting to go on to play collegiately. The 6-foot-3, 200-pound wide receiver had size, good hands, jumping ability and quickness. And it helped that he played for a premier program like Bingham High School. Cosper proved instrumental in helping the Miners win the Class 5A state championship last year then followed that by aiding the boys’ basketball team in its run to a state title. So attention hardly should have been lacking. But Cosper found himself without an offer to play in college just a few months ago. Cosper said it all began to change when Weber State offered him a chance to play football. Then came the service academies. Both Air Force and Navy decided that a guy like Cosper would be a good thing. He got one more offer to play locally at the end of June, and he jumped on it. Even if it was the rival of his favorite team growing up. Cosper came up big in some of the Miners’ most important games last season. 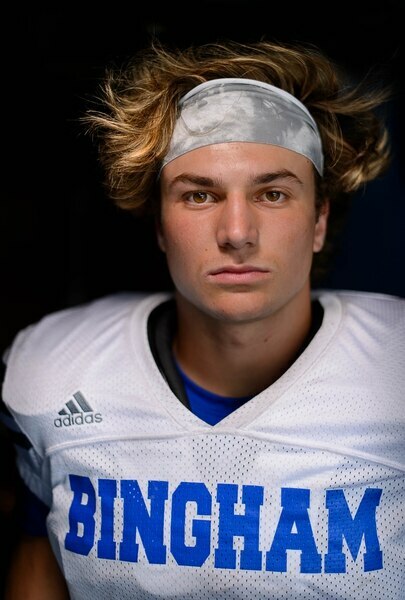 He caught four passes for 166 yards against Lone Peak during the regular season before reeling in a 22-yards touchdown reception just before half to cut into a 10-0 deficit and swing momentum back to Bingham against Lone Peak in last year’s championship. As if he hadn’t inflicted enough pain on Lone Peak, he played a key role in the Miners’ knocking off the Knights in the 5A state title game, which added to his unlikelihood of ever winning a popularity contest at the Highland school. The football field is where Cosper earned his scholarship offer. And he’ll be needed in Friday’s game against East, the top-ranked team in the state. He only caught one pass for 9 yards in the opening-week win over Orem. “The matchups we can create are varied,” Bingham coach John Lambourne said about Cosper. “He’s not just a big kid. He moves real well, too. That puts him in the upper echelon in this state, absolutely. Lambourne has watched Cosper’s growth and knows the headaches he can create. That’s why he wasn’t worried when the college offers didn’t come pouring in right away. “I knew it would only be a matter of time where he would impress enough and get some offers,” Lambourne said. And with his future after this year secure, Cosper can focus on the task at hand — facing the Leopards. “How could you not be excited for this game?” he asked. Altamont at Lyman (Wyo. ), 4 p.m.
Grantsville vs. Minico (Idaho) at Idaho State, 5:30 p.m.
Green Canyon vs. Shelley (Idaho), 8:15 p.m.
Sutter (Calif.) at Orem, 4 p.m.